When will interest rates rise? Interest rates are rising in the US as the economy continues to expand. There has been a view in some circles that this will also cause interest rates in Australia to rise. However, this does not seem to be the case. While there have been two rate hikes so far in 2018 in the US, local expectations of an increase continue to be pushed out. The RBA cash rate reflects the economic environment of Australia, not the rest of the world. With property prices falling, low inflation and minimal wage growth there is no current catalyst for a rate hike. When does the market expect a move? 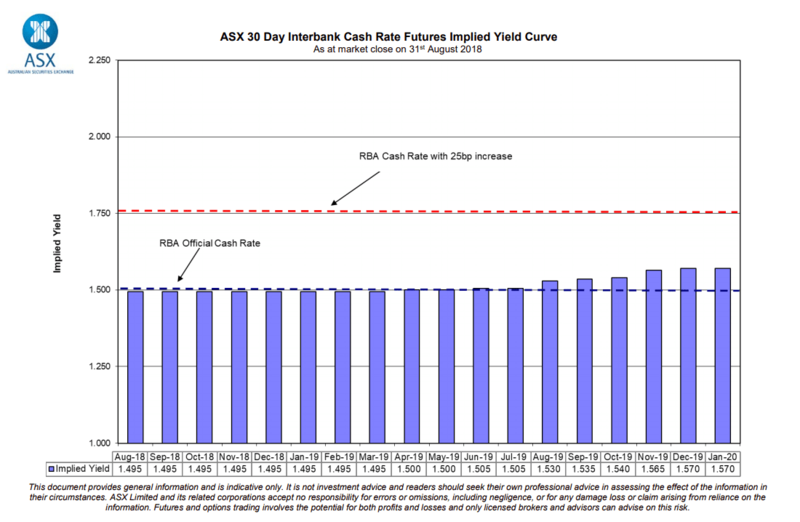 The ASX Interbank Cash Futures Chart (Chart 1), shows the market is currently pricing the cash rate at January 2020 at 1.63%. That’s a little shy of a 50% probability of a 25 bps increase in the RBA cash rate by January 2020. Only a few months back, the market was predicting the first increase to be late 2018 or early 2019. The goalposts for a rise seem to be moving out. This is in line with commentary from Westpac’s Chief Economist Bill Evans who noted that he expects rates will be on hold until the end of 2020. The other major banks have also extended their forecasts out further on any hike from the RBA. This has also been reflected in government bonds. The yield on the 3-Year government bond is currently at 2.04%, down from 2.25% in April. Bond prices over this period have risen when most market commentators were calling for bond price falls and rising yields. There’s five quarters between now and January 2020 – too long to do nothing and wait for a rise. Those investors who moved some of their cash out of Term Deposits into corporate bonds when rates first dropped to 1.5% two years ago have had a good experience. If the market is correct we’ve only just reached the mid-way point of this flat cycle. This leaves plenty of time to benefit from the additional return a corporate bond can offer over a Term Deposit. Yields as at 31 Aug 2018. Focusing on just one XTB (YTMDX1) we can see how returns are improved by moving from a TD to this XTB. Corporate bonds provide predictable returns for investors and have a similar pay-off profile as a TD – return of capital and set income payments along the way. Bonds don’t have the government guarantee of TDs. Bond investors are effectively loaning money to top ASX-listed companies rather than a bank. But, in exchange for the additional risk, the yield achieved is generally higher. If market views change and you need to sell, being traded on ASX means XTBs offer that flexibility. We also continue to receive interest from clients that need a solution outside of low cash account offers. We have seen interest in the following floating-rate XTBs. Disclaimer: The information in this article is general in nature. It should not be the sole source of information. It does not take into account the investment objectives or circumstances of any particular investor. You should consider, with or without advice from a professional adviser, whether an investment is appropriate to your circumstances. Australian Corporate Bond Company Limited is the Securities Manager of XTBs and will earn fees in connection with an investment in XTBs. This article was first published on XTB website here.